Orangutans are our close relatives. It’s easy to fall under the charming spell cast by the auburn hair and quizzical expression of a playful youngster — especially when the child in question is a baby orangutan. These apes, featured in the NATURE program Orangutans: Just Hangin’ On, stir our emotions easily. Whether it’s their alert eyes, grasping hands, or desire to be hugged, many things about them seem humanlike. That’s not surprising when you think about how closely related we really are. The only primate closer to us is the African ape. 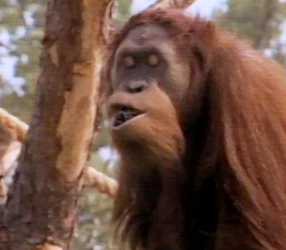 But as human as they seem, orangutans are actually wild animals perfectly suited to their forest environment. Weighing in at a hefty 200 pounds, an adult male orangutan is four times as strong as an adult male human and the largest animal to dwell in trees. When climbing on vines, orangutans’ flexible hip joints and hand-like feet make them seem to have four arms rather than two arms and two legs. The natural home of the orangutan is the leafy canopy of the Southeast Asian rainforests in Sumatra and Borneo, which are abundant with the fruit that these apes eat. The growth of the logging industry in these areas has placed this habitat in grave danger, so many zoos have begun programs to increase the worldwide orangutan population. Thirteen Online is a production of Thirteen/WNET New York's Kravis Multimedia Education Center in New York City. Funding for the TV series NATURE is made possible in part by Park Foundation. Major corporate support is provided by Canon U.S.A., Inc., Ford Motor Company, and TIAA-CREF. Additional support is provided by the nation's public television stations.